Toxic talk and gossip in the workplace is not only distracting but it can wreak havoc on your office morale. Work productivity can go down because people are emotionally caught up in drama. Anxiety and tension can have people “walking on eggshells” around one another and there might even be unexpected turnover or loss of great talent due to the toxic environment. 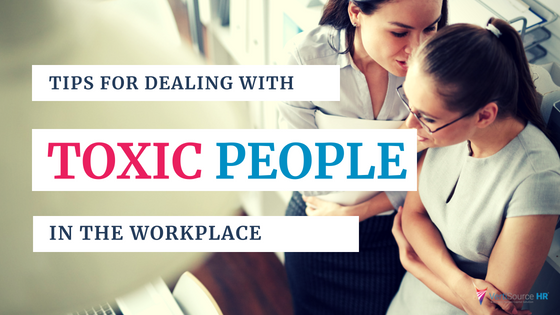 Whether the catalyst is one person or a number of them, toxic people have a huge effect on everyone you work with. Sometimes it’s hard to define, but you know it when you hear it. When light conversation and idle chit chat suddenly turns to negative or causes the embarrassment of others, you have entered the gossip realm. And as far as Human Resources is concerned, that’s a form of attack and violence in the workplace. Does the chit chat rejoice in the misfortune of others? Is it an unsubstantiated rumor about another employee’s work situation (a promotion or demotion)? If you can physically distance yourself from the toxic person or people, try to find excuses to work in different areas of the building. If this is not possible, create mental and emotional distance for yourself. Music might help you tune him or her out, or even just simply wearing headphone without music creates a buffer that tells people you are not interested and cuts off instant access. Stop giving toxic people your headspace. It can be difficult but it’s important for your own wellbeing to take the emotions out of your reaction to these toxic people. They’re going to do what they’re going to do, but you don’t have to get upset about it. Get right with that reality, and start taking your personal power back! Start by knowing your own boundaries and making them clear to the people around you. If toxic people ignore your boundaries and become inappropriate in a professional setting then you should make a complaint. Try not to allow this complaint to be personal as its about inappropriate behavior and should be acknowledged accordingly. Keep it professional and be aware that there may be backlash. By being ready for this, you are keeping your peace and putting your foot down. What’s the best way to counter negativity? Positivity! Be a role model by not engaging in the gossip or change the subject entirely. Make a conscious decision to stay happy and have fun with the people around you. Your own self talk can help you through this and help uplift your mood, thus affecting the people around you. This approach also gives you a lot of power in the situation because you are not a slave to whims and moods of others. A huge frustration in life is trying to control another person. It can’t be done and it just creates resentment and hostility in you. Therefore, don’t completely block out the toxic person. You will need to cooperate with them on some level given your mutual workspace. Let him or her speak, share ideas and don’t interrupt them. No one likes to be shut out entirely and you don’t want to be accused of being someone who doesn’t listen to others. Give him or her the respect he or she deserves in their professional position so you’re poised to ask for the same. For more wellness tips, visit our post, “How to Revitalize Yourself at Work”.